Swans are birds of the family Anatidae within the genus Cygnus. The swans' close relatives include the geese and ducks. Swans are grouped with the closely related geese in the subfamily Anserinae where they form the tribe Cygnini. Sometimes, they are considered a distinct subfamily, Cygninae. There are six or seven living (and one extinct) species of swan in the genus Cygnus; in addition, there is another species known as the coscoroba swan, although this species is no longer considered one of the true swans. Swans usually mate for life, although “divorce” sometimes occurs, particularly following nesting failure, and if a mate dies, the remaining swan will take up with another. The number of eggs in each clutch ranges from three to eight. Swans are the largest extant members of the waterfowl family Anatidae, and are among the largest flying birds. The largest species, including the mute swan, trumpeter swan, and whooper swan, can reach a length of over 1.5 m (59 in) and weigh over 15 kg (33 lb). Their wingspans can be over 3.1 m (10 ft). Compared to the closely related geese, they are much larger and have proportionally larger feet and necks. Adults also have a patch of unfeathered skin between the eyes and bill. The sexes are alike in plumage, but males are generally bigger and heavier than females. Swans' legs are normally a dark blackish grey colour, except for the two South American species, which have pink legs. Bill colour varies: the four subarctic species have black bills with varying amounts of yellow, and all the others are patterned red and black. Although birds do not have teeth, swans have beaks with serrated edges that look like small jagged 'teeth' as part of their beaks used for catching and eating aquatic plants and algae, but also molluscs, small fish, frogs and worms. The mute swan and black-necked swan have lumps at the base of their bills on the upper mandible. Swans are generally found in temperate environments, rarely occurring in the tropics. A group of swans is called a bevy or a wedge in flight. Four (or five) species occur in the Northern Hemisphere, one species is found in Australia, one extinct species was found in New Zealand and the Chatham Islands, and one species is distributed in southern South America. They are absent from tropical Asia, Central America, northern South America and the entirety of Africa. One species, the mute swan, has been introduced to North America, Australia and New Zealand. Swans feed in water and on land. They are almost entirely herbivorous, although they may eat small amounts of aquatic animals. In the water, food is obtained by up-ending or dabbling, and their diet is composed of the roots, tubers, stems and leaves of aquatic and submerged plants. Although swans only reach sexual maturity between 4 and 7 years of age, they can form socially monogamous pair bonds from as early as 20 months that last for many years, and in some cases these can last for life. The lifespan of the mute swan is often over 10 years, and sometimes over 20, whereas the black-necked swan survives for less than a decade in captivity. These bonds are maintained year-round, even in gregarious and migratory species like the tundra swan, which congregate in large flocks in the wintering grounds. Their nest is on the ground near water and about a metre across. Unlike many other ducks and geese, the male helps with the nest construction, and also take turns incubating the eggs, and alongside the whistling ducks are the only anatids that will do this. Average egg size (for the mute swan) is 113×74 mm, weighing 340 g, in a clutch size of 4 to 7, and an incubation period of 34–45 days. Swans are highly protective of their nests. They will viciously attack anything that they perceive as a threat to their chicks, including humans. One man was suspected to have drowned in such an attack. Bewick's swan, Cygnus (columbianus) bewickii is the Eurasian form that migrates from Arctic Russia to western Europe and eastern Asia (China, Korea, Japan) in winter. It is often considered a subspecies of C. columbianus, creating the species tundra swan. Whistling swan, Cygnus (columbianus) columbianus may be used to refer specifically to the North American form. The fossil record of the genus Cygnus is quite impressive, although allocation to the subgenera is often tentative; as indicated above, at least the early forms probably belong to the C. olor – Southern Hemisphere lineage, whereas the Pleistocene taxa from North America would be placed in Olor. A number of prehistoric species have been described, mostly from the Northern Hemisphere. In the Mediterranean the leg bones of the giant swan C. falconeri was found on the islands of Malta and Sicily, may have been over 2 meters from tail to bill which was taller (though not heavier) than the contemporary local dwarf elephants (Palaeoloxodon falconeri). "Łabędź" (Polish for "Swan") is a Polish–Lithuanian coat of arms which was used by many Polish szlachta and Lithuanian Bajorai (noble) families under the Polish–Lithuanian Commonwealth. The variant here given is the coat-of-arms of writer Henryk Sienkiewicz's family. The swan is white, the crane is white, what is the difference between swan and crane? (During the) prudence test of water and milk, the swan is proven swan, the crane is proven crane! The Black Swan theory originates from the erroneous presumption in Ancient Rome that black swans didn't exist, leading to the black swan as a metaphor for something that could, in theory exist, but doesn't. After the "discovery" of actual black swans, this became a metaphor or analogy for something, typically an unexpected event or outlier, that has an unforeseen significance. ^ "Northcote, E. M. (1981). "Size difference between limb bones of recent and subfossil Mute Swans (Cygnus olor)". J. Archaeol. Sci. 8 (1): 89–98". ^ "Fossilworks Cygnus Garsault 1764 (waterfowl) Reptilia – Anseriformes – Anatidae PaleoDB taxon number: 83418 Parent taxon: Anatidae according to T. H. Worthy and J. A. Grant-Mackie 2003 See also Bickart 1990, Howard 1972, Parmalee 1992 and Wetmore 1933". ^ "Swan Breeding Profile: Pairing, Incubation, Nesting / Raising of Young". Retrieved 5 July 2018. ^ Harper, Douglas. "swan". Online Etymology Dictionary. ^ cycnus. Charlton T. Lewis and Charles Short. A Latin Dictionary on Perseus Project. ^ κύκνος. Liddell, Henry George; Scott, Robert; A Greek–English Lexicon at the Perseus Project. ^ Harper, Douglas. "cygnet". Online Etymology Dictionary. ^ a b Young, Peter (2008). Swan. London: Reaktion. p. 13. ISBN 978-1-86189-349-9. ^ Madge, Steve; Burn, Hilary (1988). Waterfowl: An Identification Guide to the Ducks, Geese, and Swans of the World. Boston: Houghton Mifflin. ISBN 978-0-395-46727-5. ^ a b c d Kear, Janet, ed. (2005). Ducks, Geese and Swans. Bird Families of the World. Oxford: Oxford University Press. ISBN 978-0-19-861008-3. ^ Young, Peter (2008). Swan. London: Reaktion. pp. 18–27. ISBN 978-1-86189-349-9. ^ Young, Peter (2008). Swan. London: Reaktion. pp. 20 and 27. ISBN 978-1-86189-349-9. ^ Schlatter, Roberto; Navarro, Rene A.; Corti, Paulo (2002). "Effects of El Nino Southern Oscillation on Numbers of Black-Necked Swans at Rio Cruces Sanctuary, Chile". Waterbirds. 25 (Special Publication 1): 114–122. JSTOR 1522341. ^ Ross, Drew (March–April 1998). "Gaining Ground: A Swan's Song". National Parks. 72 (3–4): 35. Archived from the original on 2014-03-26. ^ Rees, Eileen (1996). "6: Swans are one of the few species that can divert to homosexuality in times of loneliness. Mate fidelity in swans, an interspecific comparison". In Jeffrey M. Black, Mark Hulme. Partnerships in birds. Oxford: Oxford University Press. pp. 118–122. ISBN 978-0-19-854860-7. ^ Catharine Bell, ed. (1999). Encyclopedia of the world's zoos, vol. 3. London: Fitzroy Dearborn. p. 1186. ISBN 9781579581749. Archived from the original on 2014-01-11. ^ Scott, D. K. (1980). "Functional aspects of the pair bond in winter in Bewick's swans (Cygnus columbianus bewickii)". Behavioral Ecology and Sociobiology. 7 (4): 323–327. doi:10.1007/BF00300673. ^ Scott, Dafila (1995). Swans. Grantown-on-Spey, Scotland: Colin Baxter Photography. p. 51. ISBN 978-0-948661-63-1. ^ Waldren, Ben (16 April 2012). 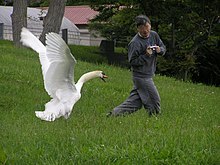 "Killer Swan Blamed for Man's Drowning". Yahoo News. Archived from the original on 7 August 2014. ^ "Who, What, Why: How dangerous are swans?". BBC News. 17 April 2012. Archived from the original on 17 April 2012. ^ Taxonomy in Flux "Archived copy". Archived from the original on 2016-01-10. Retrieved 2016-01-12. CS1 maint: Archived copy as title (link) Boyd, John (2007). "Anserini" (PDF). Archived (PDF) from the original on 22 September 2016. Retrieved 30 August 2016. ^ Boev, Z. 2000. "Cygnus verae sp. n. (Anseriformes: Anatidae) from the Early Pliocene of Sofia (Bulgaria)". Acta zoologica cracovienzia, Krakow, 43 (1–2): 185–192. ^ "COSCOROBA SWAN". Archived from the original on 2016-08-08. ^ "The opera novice: Wagner's Lohengrin". The Daily Telegraph. Archived from the original on 3 December 2016. Retrieved 2 December 2016. ^ "The opera novice: Parsifal by Richard Wagner". The Daily Telegraph. Archived from the original on 20 December 2016. Retrieved 2 December 2016. ^ "Baked Swan. Old Elizabethan Recipe". elizabethan-era.org.uk. Archived from the original on 2010-10-27. ^ Young, Peter (2008). Swan. London: Reaktion. p. 70. ISBN 978-1-86189-349-9. ^ "What is the origin of the phrase 'Swan song'?". phrases.org.uk. Archived from the original on 5 December 2016. Retrieved 2 December 2016. ^ Young, Peter (2008). Swan. London: Reaktion. p. 27. ISBN 978-1-86189-349-9. ^ "The Fate of the Children of Lir". ancienttexts.org. Archived from the original on 4 September 2016. Retrieved 2 December 2016. ^ "Whooper Swan". wwf.panda.org. Archived from the original on 3 December 2016. Retrieved 2 December 2016. ^ "BIRDS OF DENMARK". birdlist.org. Archived from the original on 5 March 2017. Retrieved 2 December 2016. ^ Young, Peter (2008). Swan. London: Reaktion. p. 97. ISBN 978-1-86189-349-9. "Swan" . Encyclopædia Britannica. 26 (11th ed.). 1911. "Swan" . New International Encyclopedia. 1905. "Swan" . The New Student's Reference Work . 1914.